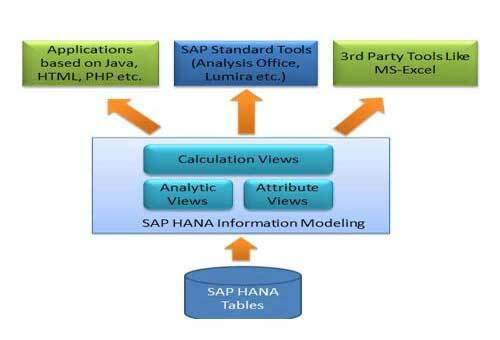 SAP HANA Information Modeling or the SAP HANA Data Modeling is the core of HANA application development. To create a meaningful report, one can develop modeling views on upper part of database tables and execute business logic. Through Java or HTML based applications or SAP HANA native applications, these modeling views can be used up. SAP Lumira or Analysis Office can be used or third party tools such as MS-Excel can be used to connect to HANA directly and report modeling views. The user refines or slice data in the database table by making information view, basis the business scenario in the SAP HANA Modeling activity. For reporting and decision-making purpose, this information views are used. To create a model for a business scenario, information view is made from several combinations of content data. Attribute: Attribute is the Non-Measureable and descriptive data. Vendor ID, Vendor Name, City, etc. are some of the examples of attribute. Measure: Measure is the type of data that is calculated and quantifiable. Revenue, Quantity Sold and Counters are some of the examples of measure. From analytic and calculation view, the measure is derived. In Attribute view, the measure cannot be created. Simple Attribute: From data foundation, simple attribute is derived. Calculated Attribute: From one or more existing attributes and constants, calculated attribute is derived. Some of the examples include Arithmetic calculation or from the first and last name, derive the full name. Local Attribute: For customizing the behavior of attribute, local attribute is used inside modelling views (analytic View / calculation view). Thus, it cannot be accessed from outside of Modelling view and is local to Modelling view. Simple Measure: From data foundation, simple measure is derived. Calculated Measure: From one or more exiting measure, constants and function, calculated measure is derived. E.g. Arithmetic calculation. Restricted Measure: To filter value based on user-defined rules for attribute values, restricted measure is used. Counter: Unique number for attributes Columns (Analytic View/ Calculation View) are displayed by this Special type of the column. To count the one or more attributes columns, counter is used. To Join table and information view and select values, Join in SAP HANA is used as per the requirement. 3 types of engines are used based on the views required by the model. Join Engine: For Attribute Views, this is used. OLAP Engine: For Analytic Views (without calculated columns), this is used. Calculation Engine: For Analytic views with calculated attributes, Calculation views, this is used.